Recently while looking for a new idea for a refreshing but substantial salad to serve for Easter brunch, we found this gem on Allrecipes.com. We liked it so much that we served it two more times within a month. Once we substituted barley for the farro with excellent results. The other time, we replaced the asparagus with fresh steamed green beans, which were delightful. 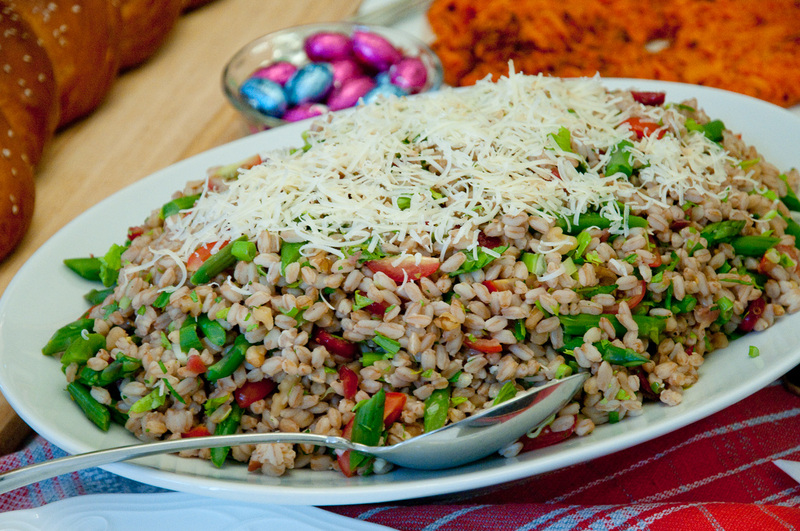 Farro is an Italian term applied to various types of wheat, and farro as sold in the United States may be used interchangeably with standard wheat berries, barley, or spelt. Many cooks recommend soaking the grains overnight before cooking; I prefer to skip the soaking and simply rinse and cook the grains for 20-30 minutes, or until they reach an al dente consistency. If you’ve cooked rice on the stove, farro is prepared in the same way. Rinse farro, soak overnight if desired, and stir it into lightly salted boiling water. Reduce heat to medium and cook the farro, stirring occasionally, for 20 minutes. Reduce heat to low, cover, and continue simmering until tender, up to 30 more minutes. Taste occasionally to check consistency; ideally, it should be tender but not crunchy. (Note: Some stores, including Trader Joe’s, sell quick-cooking farro that you can prepare in only 10 minutes.) Drain if needed, and allow to cool. As it cools, toss it occasionally to keep it from sticking together. Add the asparagus to a large pot of lightly salted water and cook uncovered until tender, about 3 minutes. Drain and immediately immerse in cold water to stop the cooking process. Cool and chop. Combine farro, asparagus, tomatoes, walnuts, cranberries, parsley, and chives in a large bowl, add the balsamic vinaigrette and 3/4 cup Parmesan cheese, and toss. Serve at room temperature or chilled, topped with the remaining cheese. Serves 6-8. Prep time: 45 minutes; can be made ahead. This entry was posted in Appetizers, Salads and Sides, Vegetarian and tagged Brunch by Baron. Bookmark the permalink.